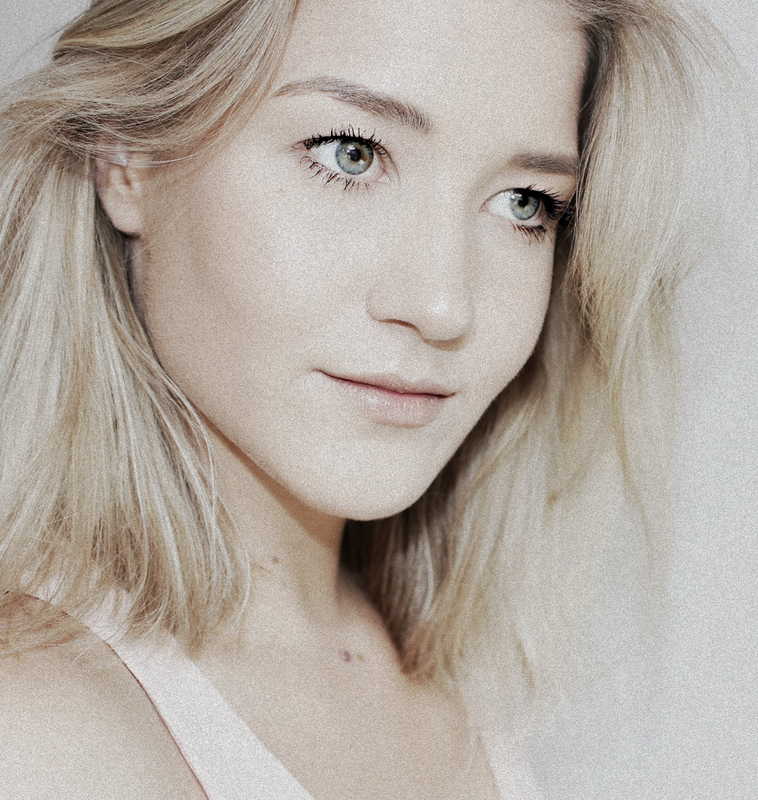 Is your hair in need of a serious pick-me-up? Mine definitely was, it had been looking really sad actually. I've been an anxious mess for a while and a trip to the hairdresser just isn't something that I'd enjoy right now. I'd love to freshen up my look but the thought of me having to walk into a salon is just terrifying, so I've been trying to switch up the products I use. 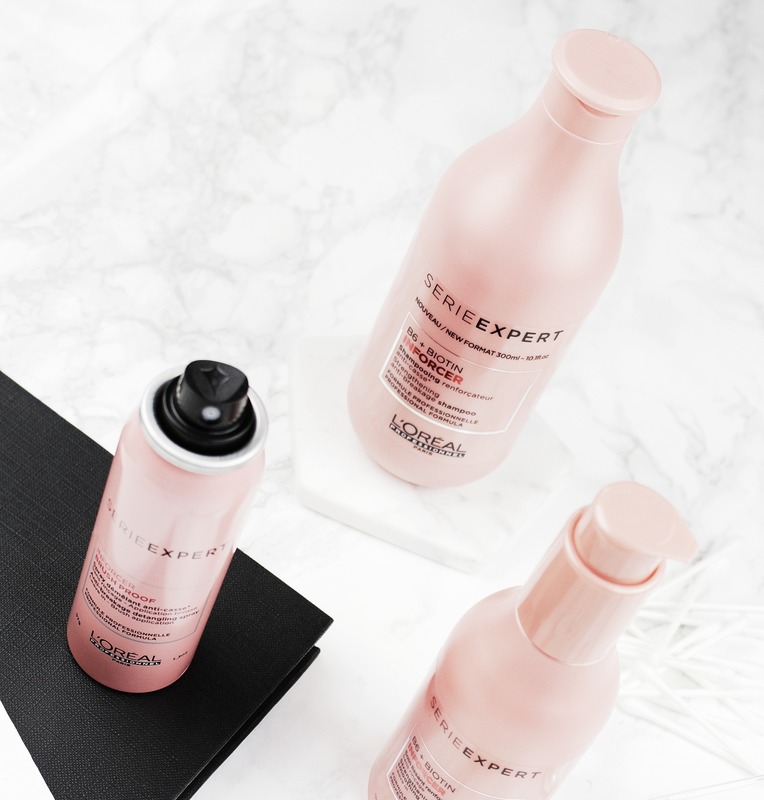 Back in July I received a beautiful PR parcel by L'Oreal Pro and I've been trying their newest Serie Expert Inforcer hair care line ever since. There are 3 products that really stood out to me that I'd love to talk to you about as they have been a great help to revive my tired and lifeless locks. Let's have a look! Have you ever tried salon hair care at home before? I hadn't, in fact I wasn't actually quite aware that the products hairdressers use are very different from what you can buy at the drugstore. I got a strengthening anti-breakage shampoo inforcer, a masque inforcer, a smoothing cream inforcer, a brush proof inforcer and an overnight serum gel inforcer. All of the Inforcer products are infused with Vitamine B6 and Biotine, which will stimulate your hair to grow and be as healthy as it can be. This line is especially formulated for those of us who have fragile hair but still love to switch up styles by using heat on our locks. 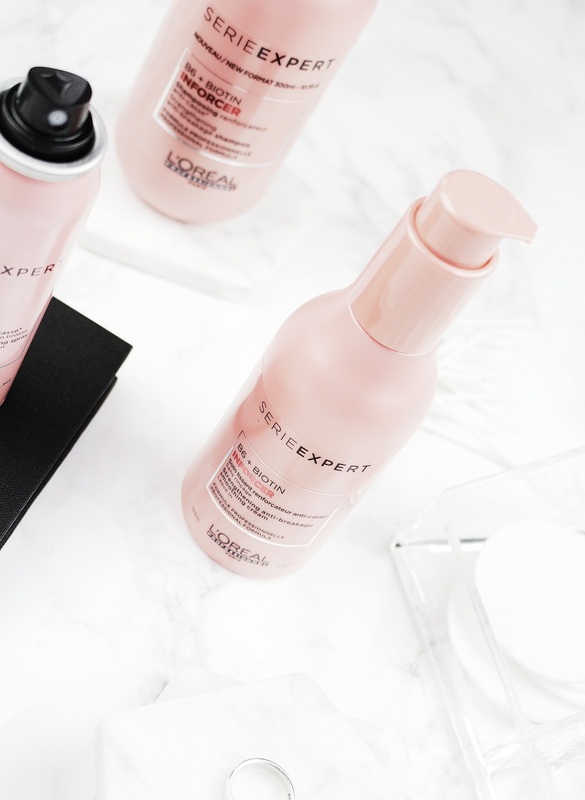 The 3 products from this line that really stood out to me and have become a part of my every day hair care routine are the smoothing cream, the shampoo and the brush proof detangling spray. 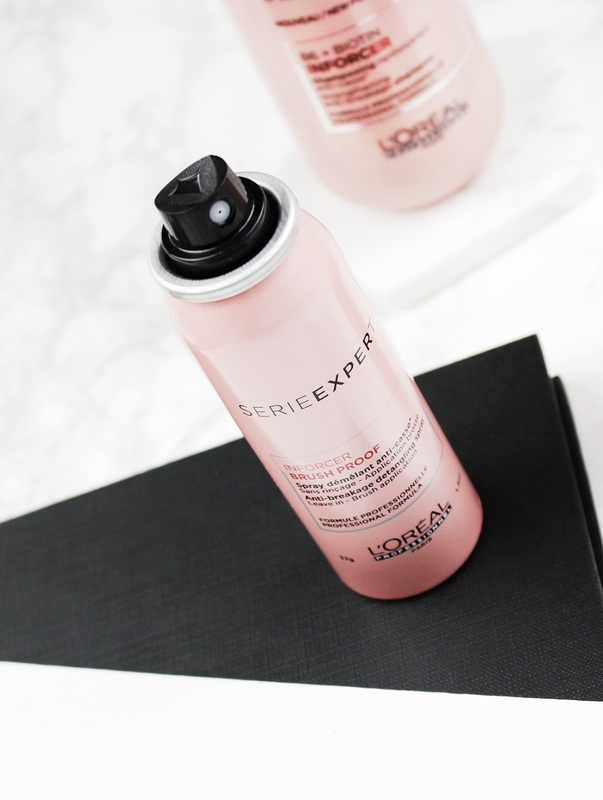 This detangling spray was particularly interesting to me as it isn't your usual spray, it's an aerosol bottle which means it makes it so much easier to evenly and effectively brush product through your hair. This is a leave in spray that I love to use when I've been out and about for a while and my hair is starting to look a little messy. It's the perfect on-the-go hair product because of its size, you can just throw it in your purse and touch up your hair throughout the day. I also have my travel size tangle teezer with me at all times for emergencies, I spray a little bit of the Inforcer Brush Proof on it and voilà! The spray also has a nice, warm honey-like scent to it, so that's an awesome plus. I do agree that this product is quite over priced for the amount you get so if you'd like me to narrow it down and save some money, the next two products are the ones I'd go for! If you want to look like you just got a salon blow out, this is the shampoo for you! I saw a real difference in my hair once I started using this. My hair looks healthy and bouncy, I have less fly aways and my simple haircut has more body and volume to it. The shampoo itself smells amazing, it's a great balance of sweet and fruity and the formula lathers up nicely. I'm a fan! This probably is my favorite product out of the three, the Inforcer Smoothing Cream. I always wondered why my flat iron wasn't styling my hair nicely, and actually almost always caused friction. Not only does this cream detangle and nourish my hair, it makes it so much easier to curl and straighten it. I've always used smoothing creams but none of them ever prepped my hair like this one does. It also takes me less time to style my hair now, I've been curling my blonde hair using a flat iron and I'm really digging the look. This smoothing cream has honestly been a life changer. 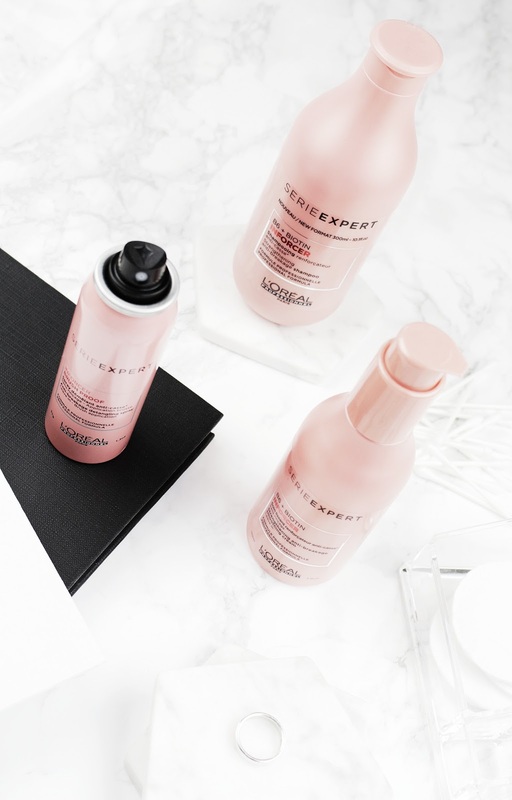 Every L'Oreal Inforcer product is available for purchase online and if you'd like to know more about the product line itself you can find all the information here.